A fair sized crowd of folk gathered in Liverpool for this year’s “God’s Glory, Our Joy” conference. There were a mere 5 sessions over the two days (down from 6 last year), the idea being to encourage informal fellowship between the papers. 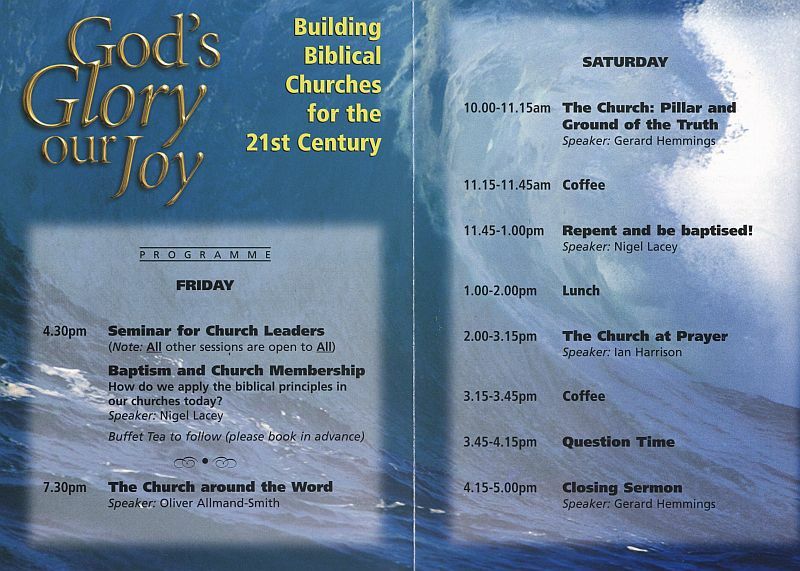 As in previous years, the papers given were broadly based around the theme of “Building Biblical Churches for the 21st Century”. Oliver Allmand-Smith kicked off on Friday evening, speaking on “The Church around the Word” from Paul’s letter to the church at Colossae. Taking Colossians 3:16 “Let the word of Christ dwell in you richly, teaching and admonishing one another in all wisdom…” as his text, he spoke about the proper focus of our meetings (the word of Christ), and the proper means to attain that focus (teaching and admonishing). He gave a strong call to centralise Scripture, and a searching exposition of what makes up good preaching, and how to listen to it. “If the word of Christ is in our meetings, we will be admonished. Arrows will be aimed at our hearts, not over our heads… We want to be transformed by the preaching, and of course it will hurt, because we’re sinners. “What is this truth?” (Answer: 1 Timothy 3:16), “What is the Church?” (The one institution entrusted with this truth, to preserve and spread it), and finally applied these things- “What about us?”. After a break for coffee, served in Calvary Chapel’s own embossed crockery, Nigel Lacey spoke clearly and intelligently on “Repent and be baptised!”– mainly on “Repent” from Acts chapters 2 and 11. We broke for lunch (at the chippy praised by London dweller Gerard Hemmings for giving proper sized portions), and then Ian Harrison spoke on “The Church at Prayer”. He had three points- the nature, the corporateness, and the content of prayer. I found this paper most helpful and practical, particularly his survey of the content of prayers in the New Testament, showing an overwhelming emphasis on spiritual needs. Gerard Hemmings preached a closing sermon from the accounts in the Gospels of Jesus and the rich young ruler. He began by describing the costliness of following Christ, with a vivid picture of a day in the life of “Andrew” and Andrew’s “Self”. In conclusion, he told us why it is worth any amount of suffering, bringing blessings now and eternally. At lunch with his colleagues, Self says ’Shut up. You don’t want to be any more unwelcome than you already are’ But self is crucified, and Andrew speaks up….